I hadn’t planned on visiting Macau at all, but my Vegas-loving husband had other ideas. Macau is a short (1hr) ferry-ride across the mouth of the Pearl River from Hong Kong. Previously a Portugese colony, and now a city which brings in more revenue from gambling annually than Las Vegas, I was expecting it to be very different from HK. 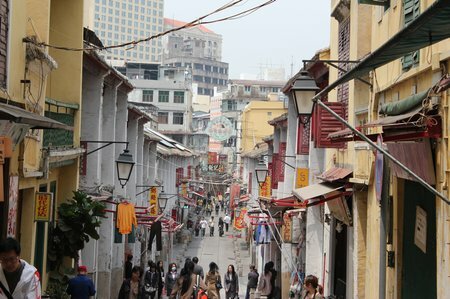 Macau has a weird mix of European old town with a warren of old narrow streets and old Catholic churches and yet it is definitely an Asian city. The neon signs are mostly Chinese characters, the towering apartment blocks, the people on the streets and their voices as they call out to each other remind you that you’re not anywhere near Europe. It may be because we arrived in Macau on a holiday, but one of my first and lasting impressions of the town will always been the lack of people. Sure, there were crounds on the main square in the old town, but nothing at all like the crush of people that we’d become used to in Kowloon. This is an example of a Maccanese street sign. To see the two languages together is neat, right? Sure. Until you’re standing at a corner where the same street name is on perpendicular sides of a junction and you’re not quite sure where the address you’re looking for actually is. It seems as if there’s some pretty serious urban regeneration projects in progress in Macau particularly around the waterfront area. The current street signage may or may not be accurate. I’m sure it’ll all be lovely when it’s completed. This we found particularly odd. We walked around most of old town and central Macau. The European buildings make you think that street cafes should abound, but they don’t. This is itself isn’t a problem but when you’ve been walking around for most of the day, there comes a point when (if you’re Murph and I) you think, “A cold beer would be just the thing around now” and then you realize that you haven’t seen any beer signs all day and not only are street cafes missing but so are your common-or-garden pubs. (We opted to return to the very pleasant Cafe Toscana off the main square). Macau does have plenty of casinos but the difference between here and Las Vegas is remarkable. We walked through a number of casino floors just to see what they were like (without the kids). Just like in Vegas, the slot-machine aisles were busy and many of the gambling tables were empty. But, there were tea ladies instead of cocktail waitresses. The ambiance was quiet and reserved. There didn’t seem to be themed bars and restaurants around the floors, although the MGM was a little better on this front than the Grand Lisboa. We didn’t see any shows advertised in or out of the casinos. When we sat in the one casino bar we found (in the MGM), we were two of a very small number of clients. We also checked out Taipa, the islet where the new casinos and resorts are being built. The small downtown here (around Rua do Cunha or Food St) appears as if it’s been custom-built for tourist foot traffic making it a pleasant area to walk around. We found at least one gelato shop which was all our boys needed to call Taipa their favorite and a “pretty nice place”. 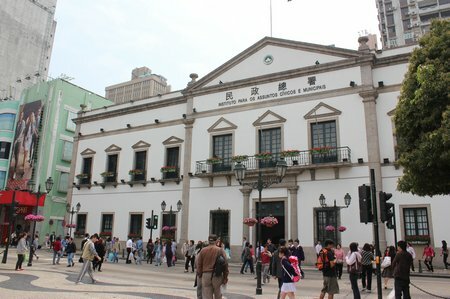 This entry was posted in China, International Escapades and tagged Macau on April 13, 2011 by wandermom. All the people in Macau are on the casino floors! Haven’t been there in 15 years, but it sounds like not much as changed. Such a funky little place with unusual surprises. Looks like such an interesting place! And any place with gelato works for my family. What a mix! I’d love to get to visit one day … Thanks for sharing your impressions! I just found out I will have an extra day in Hong Kong. 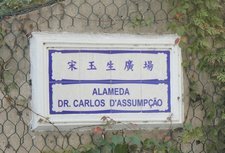 I’ve always been intrigued by the mix of Chinese and Portuguese in Macau and wanted to check it out, but with so much to see in so little time in HK, I haven’t been able to. Maybe we will head out there on Wednesday. I could sure use a gelato about now. If you have any other tips, send them my way. Hoping to get to the giant buddha and Ten Thousand Buddha temple if the little guy will allow it.